I have some ideas for improvements for the snapshot graphic. Firstly, it would be nice if it DIDN'T include the close dialog icon and the "click to save shot" text. Secondly, do not generate the shot automatically after a manual test. Instead, have an option where you can right click on a previous test result and choose "generate shot" from there. That way you can pick and choose exactly which one you want and you can simply remove the close icon and "click to save shot" text from the template image entirely. 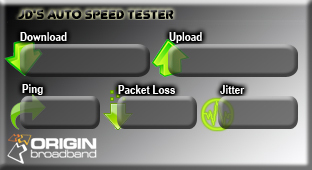 Thirdly, it would be nice if I could configure the tester to automatically paste the graphic of my choosing (the Origin Broadband logo) into the shot automatically. Or at least I would prefer to move the date/time to the right so I can put the Origin logo manually on the bottom left, or perhaps have the gap at the top instead with the date/time on the top right. That way I could have the Origin logo on the top left, so it draws your eye. Lastly, have the option for the automated tests to generate the results shot and upload it to an FTP server, entirely automatically. This would mean people could leave it running when they are away from their PC and check on the results from their web server. Quote: Firstly, it would be nice if it DIDN'T include the close dialog icon and the "click to save shot" text. these i can understand and quite probably do, shall think on this one. 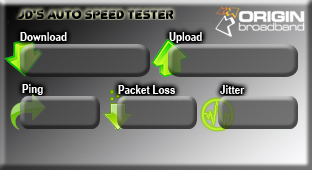 Quote: Thirdly, it would be nice if I could configure the tester to automatically paste the graphic of my choosing (the Origin Broadband logo) into the shot automatically. These i dont think id implement , i really dont have the inclination to have gaps for personal branding. 99% of people would not want or use it and it would just end up with an odd looking gap. i mean its perfectly possible but i spent ages trying to get rid of all the wasted space, shrinking the size down as much as i could etc. Quote: Lastly, have the option for the automated tests to generate the results shot and upload it to an FTP server, entirely automatically. This would mean people could leave it running when they are away from their PC and check on the results from their web server. Well i did like the idea about not showing the manual results pic and having a "create result pic" context option , luckily i have been working on a context menu on the listview and the graph itself so this was not to hard to sort out. I have put the time in the middle but i could always put in an option in the .ini file so you can set it to not draw the box around the time and move it to the left, you would just need to add an entry in the main.ini file as its to much of an individual request for me to make an option in the main program (shall sort that out later if your wanting me to do so). and about your last suggestion , i did not quite understand what you meant because iv been stuck on the idea of uploading the results of people (who opt in) to our site and along with there SP info and making a comparison for all the different SP's from the data. I read your comment again and see what your asking and i would say its not a bad idea and i will ponder on it for a bit but i would remind you that there already is an automated email system that can be set up to email any address at regular intervals or/and if the speeds drop down to a user pre-set threshold level. I know its not quite the same but not far off. My point about the graphic was that there is already plenty of space to fit it in, its just there is currently other things overlapping those areas that do not need to be. For example I think the underlining on the title feels cluttered and actually makes it harder to read, as well making the unused space at the top unusable. One compromise could be to have a "custom text" option for the date/time, so you could add the ISP name before the date/time. Perhaps the option to make the font a little smaller too for longer ISP names to fit? I just think its important to be able to include your ISP details on there too like speedtest.net does and logos are much quicker to identify (and generally prettier to look at) for many ISPs than a string of text. Im not sure if its going to be usable as I don't think im using the best method to lookup that info from the DB's out there that don't cost (Basically querying the RIPE Database and trying to pick it out from there). If you know of a "proper" method to do this id be most grateful. If it can't get a result from this query then it shows a different arrangement which i think is pretty much what your after. On another subject I was also wondering about this problem that your upload testing shows. Iv added some comment to this thread http://www.drlforum.co.uk/showthread.php?tid=50&page=5 and would be very interested in any help you may be able to provide. The looks and functionality of jdast are all very well but the one thing i really must get 100% (or as near as dam it) is the accuracy. Yes I think that looks a lot better. I particularly like the date at the top, seems to make than underlining more relevant somehow. I presume for the ISP information you are just doing a standard whois on the IP? I can't really think of any reason NOT to do it that way, it should be pretty reliable. Its also useful if you are able to log the ISP as that way you can include that information in the log and group together results by ISP. (13-05-2012 12:21 PM)alexatkin Wrote: Its also useful if you are able to log the ISP as that way you can include that information in the log and group together results by ISP. Aye, yea i am doing a pretty simple whois and getting the ripe data but the data is not always presented in the same way, its not as simple as the ISP's name is always in the same "field" especially when it's in another country (and i prob have more users outside this country than inside) however it seems to be ok for the UK as far as i can tell. Shall be putting up the beta for all the peoples requests shortly. I have included your idea about not showing the results pic and adding it to the context menu i was already working on but not the uploading of the users data to a remote account as yet though, still pondering that one ^^.